Many thanks to Elizabeth Cline, of The Good Closet, for interviewing me about five8ths! I really enjoyed the opportunity to delve into what makes my work special. Read the interview here, and be sure to check out the rest of The Good Closet blog. Her new book, Overdressed: The Shockingly High Cost of Cheap Fashion just came out and I can't wait to order my copy. Tell us about five8ths, your Baltimore-based clothing business. What inspired you to start up? I’ve had a passion for clothing and fashion design from a young age, but my path has also wandered through the worlds of art, sociology, costume design, and Montessori. On my honeymoon trip to Mali in 2006, I saw for the first time an example of how to work in fashion and not sacrifice my ideals. Each person wore a unique garment, custom designed and often made from colorful wax printed cottons. Independently-owned custom clothing-maker’s shops dotted nearly every street in Bamako. In order to have a new outfit made, a person went to the market to pick out fabric, then took it to a tailor’s shop to discuss the design and have measurements taken. In a few days, the design was cut and sewn to size (the tailor who made a shirt and skirt for me used a treadle machine and an iron that was heated with coals). This concept of clothing being made with a person in mind really inspired and appealed to me. This is a functional form of art, design, and craft that affects the way people behave. Making clothes is work that combines so many of my interests and allows me to spend my time doing something that I believe in. After teaching in public Montessori for five years, I had the chance to live in South Africa last year where my husband was working. While there I spent my time refining my skills and developing the framework for my business. I spent a lot of time working on custom-designed and custom-tailored clothing for myself, my husband, and friends in Johannesburg. When I moved back to Baltimore, I began working part-time in public Montessori again and also started five8ths during the fall with both a men’s and women’s line. As I prepared to attend my first craft fair during the holiday season, I began concentrating on men’s shirts, and developed standard sizing. 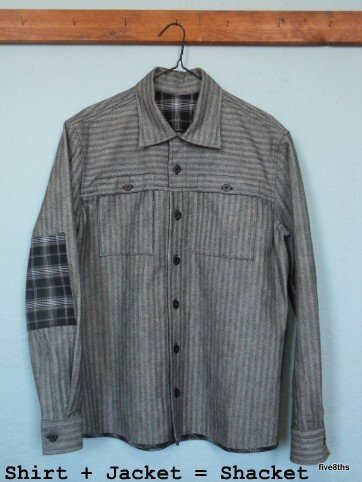 I now also have my first spring/summer line of men’s shirts, and offer the option of ordering standard sizes, semi-custom, or bespoke (fully custom). What pieces are you most excited about in your line right now? What types of materials do you use and where do you get them? I am always most excited about the latest design I’ve drafted, or even just the latest shirt that I’ve sewn. I take great pleasure in noticing the tiny improvements in skill and craftsmanship that result from the practice of making each shirt. That said, the Shacket, especially its front yoke that doubles as pocket flaps, is still my favorite design overall. I use only plant-based, 100% natural fabrics (no synthetics). This includes cottons and linens at the moment, but I’m also sourcing hemp and bamboo. I like the look and feel of these fabrics but there is also an environmental benefit to not using synthetic fabrics. (There is evidence that when synthetic fabrics are washed, nano-particles of plastic get washed down the drain and eventually make it into waterways and oceans, where they are ingested by animals repeatedly up the food chain.) I would like to incorporate organic fibers as soon as possible, and even hope to take the handmade element even further and be able to offer fabrics made in small mills or even hand-woven fabrics some day. Do you work out of a home studio? Yes. I love working from home and being able to be productive on specific tasks when my energies are most effective (sewing in the morning, tackling the business side during afternoon energy-lulls, attaching buttons by hand in the evening while relaxing on the couch, etc.). It must be difficult to convince people to pay custom prices when stores can sell a button-up shirt for $20? Shirt prices vary wildly, this is true, and everyone has their own price-point. I have always been very conservative with the way I spend money, so I am sympathetic to sticker-shock. Some people who are happy with $20 shirts probably won’t be convinced that paying for hand-made clothes is worth it, and that’s fine. But there are a number of reasons that hand-made is worth the cost to me and my customers. The price is not high because I am charging a premium. The price is high because it takes a lot of time, labor, and quality materials to get the quality of clothes that I aim to produce. In other words, it is not my goal to create shirts for a luxury market—it is my goal to create high-quality, long-lasting shirts that don’t need to be replaced as often and therefore might compare in price to another type of more disposable shirt over the life-time of the shirt. Also, it’s easy to overlook the hidden costs in cheap clothing—when people pay $98 for a mall-store shirt that’s made half-way across the world in abusive factory conditions, my prices seem relatively low! That said, I understand my prices are high for most people and I do everything I can to keep the prices as reasonable as possible. Custom clothing of course fits much better than storebought; are there other advantages that those who don’t own custom clothing might be overlooking? Because each shirt is designed, drafted, cut and sewn by me, I produce only 5-10 of each design, so every shirt is limited-edition. Each individual shirt is also truly unique in that each is handmade, and often made-to-size. Making each shirt by hand allows for utmost attention to detail in design and craftsmanship. All of my seams are flat-felled, which means the edges are enclosed for a clean look and comfortable feel, and are sewn with two lines of stitching, which reinforces the seam. The buttons are sewn on by hand, and are unlikely to fall off, but if so, I hand-sew an extra button to the inside of the shirt for replacement—I hope that each shirt will be worn often and over many seasons, and want to encourage simple repairs like replacement of buttons to extend the life of the garment. I add decorative, but also strength-building plackets on the hem of the side-seams and openings. The collars and cuffs are sculpted so that they maintain a cylindrical form on their own, which ensures a more polished look. There’s a relationship between you and your client. Do you think that the social element is a selling point of custom clothing? When I’m working with a client, I am sculpting a piece of fabric around his body. Throughout the duration of his measuring or fitting appointment, we shift back and forth from a very social relationship to that of sculptor and sculpture/subject. There’s a lot of trust involved on the part of the client. I ask a lot of questions about how the client likes the fit to feel and look, and we work together to create something that looks good and also feels comfortable. Getting to know a client fuels the creative process of identifying a style that fits the body type and lifestyle of the person. Each shirt is a sculpture, but also almost an extension of the personality of the client, and very unique in that way. Even for non-custom I think an increasing number of people enjoy being able to meet and interact with the person who is making the products they use. Buying a one-of-a-kind garment has a different ethical and environmental footprint than storebought clothing. Can you tell us about that? There are so many things to say about this, and I’m sure I don’t have space to cover them all here, so I’ll only name a few. 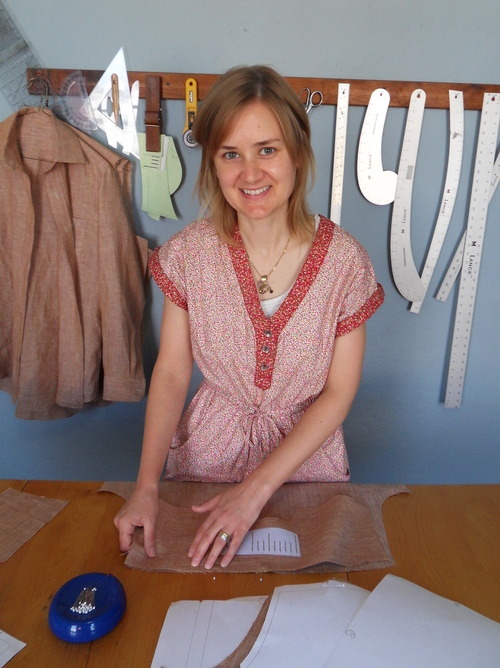 One, there is little to no waste involved when buying a custom-made garment. Large production of standard sizes inevitably produces excess clothing at one stage or another. Many may never sell, and the garments that are bought, perhaps cheaply, may not be valued enough by the consumer to be worn very often, and might end up being discarded after a short time or very few wearings. Where do all of the clothes go that people discard? Trendy or poor-quality fashion creates mountains of textile waste. Even donated clothes can have negative impacts. For example, the flood of cheap donated clothes has been blamed in part for the decline of domestic textile industries in many countries in the global South. Another obvious component of buying locally-made, handmade products, is the sustainable practice of supporting labor locally. My clients know me and can always come back to request changes or repairs—my work has my name on it. Supporting a craftsperson supports the continuation and development of artisan work that has become scarce in our society. Keeping money in the local economy helps everyone in the community. The money spent on a five8ths shirt stays in the community as I use it to invest in materials and supplies (I support local businesses as much as possible both for my business and personally). People say they can’t afford nicer clothing. But I’ve found that what’s really going on is they’re attached to buying a lot of clothes, even if they don’t wear or like most of them. How do we get people out of this habit of quantity over quality and to view their clothes as an investment? The practice of buying a few, nice outfits each season, getting them altered to fit well, and wearing them frequently, is a foreign concept to many among us. Because cheap clothing has become so pervasive it is actually difficult to find quality clothes. As a result, shopping habits have changed so that we buy too many clothes (too many to keep track of or to justify an extra tailoring expense when the item may only be worn a few times), and I think this has even led to a deterioration of style. A growing number of people are now thinking of food choices as ethical choices. Because of the things discussed above (environmental concerns, labor practices, supporting a local economy, etc.) clothing purchases can be thought of in the same way. It starts with making it a habit to consider: Do I really love this, and will I wear it often, for many seasons? Where was it made, by whom, and in what conditions? Once a person starts considering these things, it’s a shorter leap to then also consider the fabric content and its environmental impact. I try to limit myself ahead of time by abstaining from shopping at stores where I know that the ethical or environmental practices are questionable. You design menswear, so where and how do you shop for your own clothes? Do you make your own custom pieces? If I had more time, I would make more of my clothes, but I also really enjoy searching out the work of other designers, dressing in clothes that contrast my own design style, and supporting other designers. Two designers whose work I’ve been excited about lately are Filly and Fischer. I aim to buy one piece per season. I frequent locally-owned boutiques that carry small independent designers, and I also spend a good amount of time in vintage, thrift, and re-sale stores, and am always up for a clothing swap! I also look for local designers whenever I travel. When I lived in Johannesburg, I frequented the local fashion events that were part of the buzzing fashion scene there. There are a number of exciting designers there, such as miyabi, take care, and Superella. I recently had a fantastic time in Montreal, where each shop that sells locally-designed and made clothing has a large sticker in the window that says: “Mode Montreal”. I fell in love with Betina Lou’s current collection, all made in Quebec. The heightened awareness for locally designed and made clothing in Montreal is something I hope to see more of in the States soon, echoing the growth of the slow food movement. Any hope for a womenswear line down the road? Yes, definitely! I have focused on men’s shirting because I wanted to hone my skills by not being too broad while developing my business. I hope to launch a womenswear line soon, starting with shirts and shirt-dresses and then expanding from there. For those interested in being notified of when the women’s line is up and running, please visit my website atwww.five8ths.com, and fill in the online form there, or email me at five8thsclothing@gmail.com.